The pentagram, devil horn hand gestures, 666, blood rituals, sacrifices… these are just some of the pictures and symbols that would flood one’s head when thinking of Satan or practitioners of Satanism. I would not disagree in saying that I too would associate some if not all of these as well when the word Satanism is mentioned. This of course is due to the representation that is brought forward when discussing said word or anyone who follows in its religion. As a nation we have been given a certain view of what being a Satanist means and the actions one would partake in. Truth like most things need to be uncovered and discovered with our own eyes in order to get the full picture; we are rarely displayed both sides of any story. Throughout the late 80’s and early 90’s television sets either through day time talk shows or the nightly news were spreading a message of fear of Satanic worshipers; when in truth the individuals they were depicting had no affiliation with Satanism and were merely displaying the stereotypical image of said followers. Documentary filmmaker Penny Lane makes it abundantly clear in her film Hail Satan? that we have no real understanding of what it means to be a true Satanist. 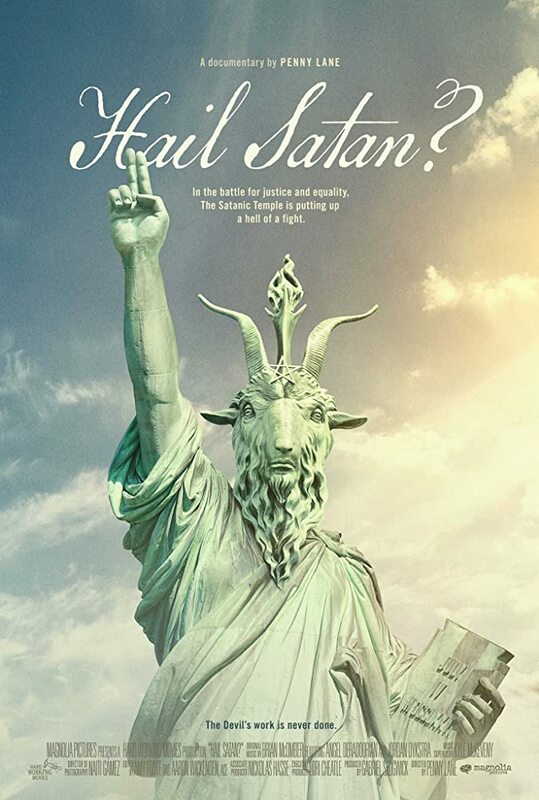 The film follows a group called The Satanic Temple which was founded 2013 and since its creation has spawned numerous chapters throughout the globe. The group’s main purpose is to raise awareness of the hypocrisy that fills our nation and to remind us all that there is to be a separation between church and state. Politicians for decades have used God, the bible and its “word” as its foundation when trying to reach voters. This film sheds some light as to why our belief in the United States of America born a Christian nation is completely wrong and that promoting the U.S as God’s country is contrary to what our founding fathers believed. The connection between these ideas and Satan are that he did not follow blindly and questioned their validity; by doing so he was cast down from Heaven. That’s it, that and that alone is why people have chosen to say with pride “Hail Satan!” It’s simply the idea of not accepting of what is given and choosing to do something about it. Regardless of gender, sexual orientation or age Satanism accepts followers in all forms and has created a safe haven for those who feel apart from the norm. The Temple’s leader Lucien Greaves serves as their spokesperson and has been the face of the institution through news coverage and protests. The highlights of the film for me were anytime the group would assemble to protest; whether it be the Westboro Baptist Church, abortion clinics and especially the State Capital in Arkansas. It is also mentioned early in the film that Satanists could be considered the earliest form of “trolling”; a term commonly associated today to those on the internet that try to “stir the pot”. That is the element of the film I enjoyed most in which this group of “outsiders” are trying to present an idea that is completely rational but due to their image is hated or deemed moral degenerates. As serious as Greaves and his followers take this religion I just wish there was an alternative to spread their cause. Their message will always be clouded by the stigma of what Satanists are perceived to be. It is mentioned the reason why they’re called Satanists is because there was nothing else to call it and that it brings an immediate attention; all that may be true but I feel at times they like pulling the strings more than advocating a true change to the system. For what it is worth I deeply encourage people to watch this film. If you can take anything away from it, it is that our country needs a shift. For us as people to accept someone simply because of their faith is absurd and to allow our country to be shaped by those individuals goes against everything this country was founded upon. In that belief and the direction The Satanic Temple is trying to push us towards, I have no words other than HAIL SATAN!